Peak is one of the very few veterinarians still seeing chickens in Redwood City after the confirmed case. She’s only treating them in the parking lot as a precaution as of right now. “It spreads rapidly and it’s very, very deadly,” Peak said of Newcastle disease. Peak sees many clients who simply own a few chickens in their yards, not just farmers with a large flock of birds, so closing the practice is impractical. According to a CBS local affiliate in San Francisco, owning your own chickens has become increasingly “trendy,” (very fashionable or in style). 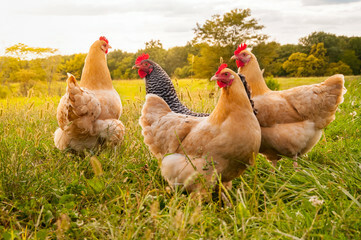 Peak warns California’s trend-setting chicken owners not to move their birds and to clean up after handling them in the aftermath of this viral outbreak news. Hilary Yoffe-Sharp owns about a dozen chickens, all of which were rescued from the humane society. She just learned about Newcastle disease and says she’s very concerned. “We’ll definitely be monitoring the situation to make sure our birds stay healthy and safe,” Yoffe-Sharp said.